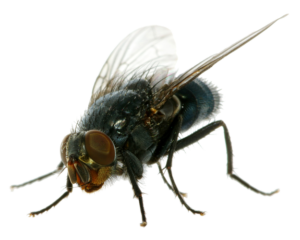 Houseflies survive only with humans in colder climates. They have a tendency to aggregate and are difficult to dispose of. They are capable of carrying over 100 pathogens, such as those causing typhoid, cholera, salmonellosis, bacillary dysentery, tuberculosis, anthrax, ophthalmia, and parasitic worms. Some strains have become immune to most common insecticides.